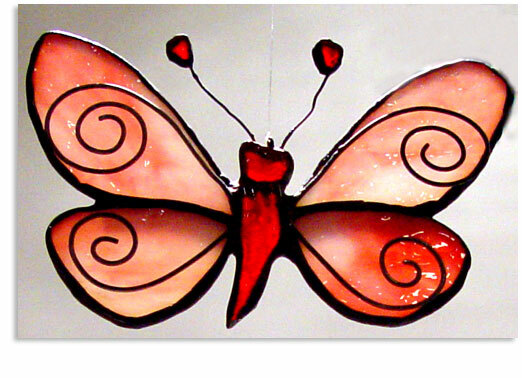 This stained glass butterfly measures 5.25 inches across and is made up 8 pieces of hand cut glass. The wings are a gold pink-white glass that glows a beautiful golden pink color in direct sunlight. The body and antenna ends are deep ruby red ripple glass. This suncatcher is constructed using lead-free silver solder and tinned-copper wire work decorates this butterfly's wings.